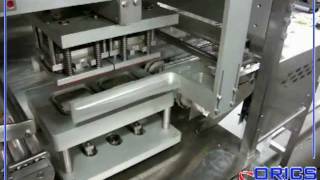 With built-in transfer system designed to work with any conveyor system, the ORICS ILTS 500 In-line Tray Sealer is for small to medium production. Automatically placed on carrier plate on inline motion machine, trays can run on any straight line conveyor system. Trays can be random or oriented; Orics ILTS Tray Sealer will orient them to correct center distance, pick and place. Machine is intended to meet need for small, quick, inexpensive solution to seal trays of fresh produce.